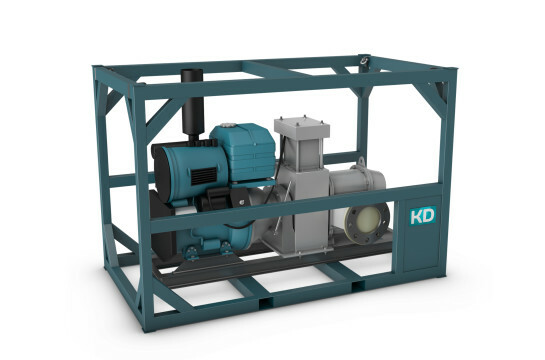 KD’s series dieselmotor lobes rotary pump skids are mounted on a carbon steel stationary offshore proof DNV 2.7.1 frame. Complete with self priming positive displacement liquid transfer pump. KD’s Mobile Diesel Pump Skid is suitable for pumping any fluid, such as muds, pastes, and thick liquids in general, even when containing solids. Suitable for industrial, offshore and oilfield applications. Flow up to 2.400 l/min (144 m3/h) max pressure 5 bar. The series Mobile Diesel Pump Skid is designed for easy and reliable operation. The Dieselmotor is designed with a Lobes rotary pump, NBR lobes, complete with suction and discharge collector and complies to the actual rules for emission CO2.